I have dipped in and out of Kerry Greenwood’s historical crime series set, mostly, in 1920’s Melbourne (with occasional forays further afield) which is an indication that it is a series I like but do not love. This instalment is probably a good example of why the series has never been one of my firm favourites. For, despite the prominence of the word in the title, there’s not actually a lot of murder or anything else vaguely criminal. 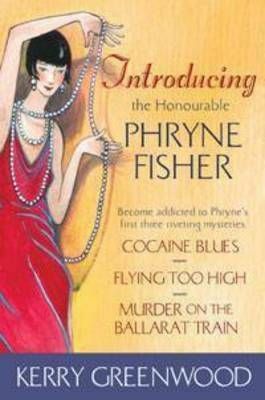 It’s the 20th novel to feature independently wealthy, private detective Phryne Fisher and sees her and her unique family ostensibly embroiled in the hunt for the killer of a choir conductor (and then another). I say ostensibly because there is a lot else going on here that seems to be more important to just about everyone in the book than finding out who killed the disagreeable conductor. Firstly there are the goings on of the choir which Greenwood depicts using her own extensive knowledge of choral singing to good effect. The problem for me is that what I know about choral music could fit easily on the back of a small postage stamp and I felt lost more than once when the book dived into specialist details such as a discussion of this composer over that one or the merits of a particular interpretation of a piece of music. I’ve read plenty of books in which topics I know little about have come alive but that didn’t happen for me on this occasion. The other main thread of the novel revolves around Phryne’s obsession with the love-life of an old war time friend. He is a doctor whom she knew when she was driving ambulances in the war and the pair share turbulent memories. But now John Wilson is in the throes of unrequited love for a Holmes-like mathematician who gives lectures about the science of deduction. A good deal of the story is taken up with Phryne’s efforts to make the aforementioned expert see what’s right under his nose and I was a bit bored by it all. There was, after all, never any doubt Phryne would get her way (she always does) and while it’s always nice to get a happy ending to a love story I wasn’t terribly interested in the nuances of how they got there. I also found the universal acceptance of the openly homosexual couple to be a bit unrealistic for the time period. Some conflict or lack of acceptance of this paring from some corner of their world would have added a bit more credibility and the dramatic element I was looking for. Despite these misgivings there are still things to enjoy about the novel. As ever, Greenwood’s writing is top-notch and peppered with humour and Phryne’s mixture of wit, intelligence, courage and love of all life’s pleasures are as endearing always. The depiction of her highly functional ‘family of choice’, consisting of a selection of adopted children and good friends, is another pleasing element. The idea that families can be made and connected by things other than blood is something Greenwood explores in both her long-running series and it adds an interesting element to her writing. The book also offers a realistic depiction of the various long-term effects of the Great War on those who served in it. I’m sure Phryne’s fans will enjoy this story but if you’re new to the series I wouldn’t recommend this particular instalment as the place to start. Happily this is one of those series you can read enjoyably out of order or without having read each instalment so I’d opt for MURDER IN MONTPARNASSE, in which Phryne and her two wharfie friends investigate a cold case from the war years, or MURDER IN THE DARK which offers a Christmas-time house party and multiple kidnappings for the readers’ entertainment. Kerrie reviewed the same book last year. This work by https://fairdinkumcrime.com is licensed under a Creative Commons Attribution-NonCommercial-ShareAlike 3.0 Unported License. Tasmania for the child’s missing mother and sister. Staying with her increasingly erratic mother, Dr Jocelyn Reynolds, Anya fears the long shadow of her sister Miriam’s disappearance has finally driven her mother past the brink of sanity. But Anya soon discovers that Jocelyn is keeping a deadly secret. scientist. Anya has strayed into a high-stakes game so dangerous the players will kill to keep it quiet. With time running short, Anya must uncover the truth before she is silenced – permanently. 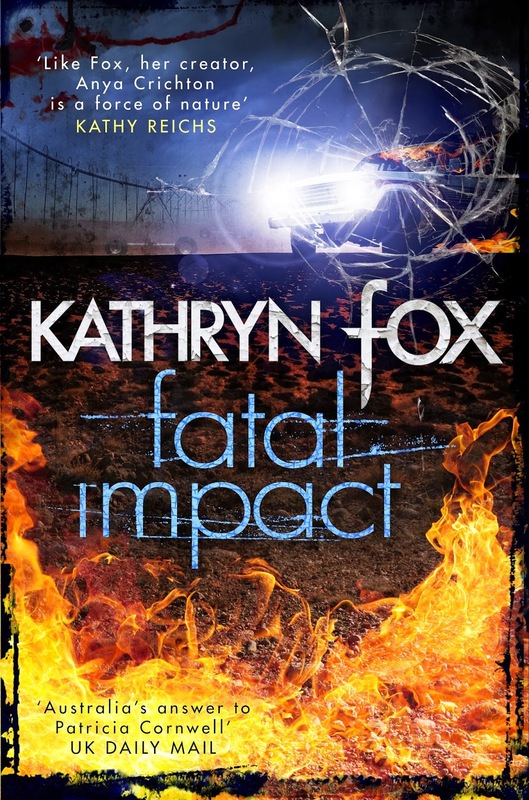 I’ve long been a fan of Kathryn Fox’s work, and this novel did not disappoint me. As always Kathryn has combined interesting issues, excellent research, and a well plotted mystery that makes the pages just fly past. Although the character of Dr. Anya Crichton has now been developed over a span of seven novels, there is nothing to stop a reader from beginning with this one. The setting of the novel is Tasmania with the issues of genetic modification of stock and products and foreign ownership of Australian land and industries running strongly in the background. Anya initially goes to Tasmania to give an address at a conference and then intends to pay a quick visit to her mother who lives near Launceston. She first of all gets caught up with the disappearance of a mother and her child, and then her father’s wife becomes critically ill. Her visit to her mother is extended when she finds her mother is not well, and then her mother’s neighbour dies.There is lots going on and the writing is fast paced. among the criminal barristers. Something about the apparent suicide of Clare Matthews doesn’t sit quite right: the fact that, a nun, she disappeared shortly before she was due to take her vows, that she suicided by jumping off the Gap, that she was 6 weeks pregnant, and that she had strange fibres in her lungs. And now another case with similarities crops up: Fatima Deab overdoses on heroine after being missing for some days and her lungs contain the same fibres. 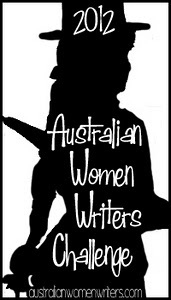 Debut publication by Australian author. 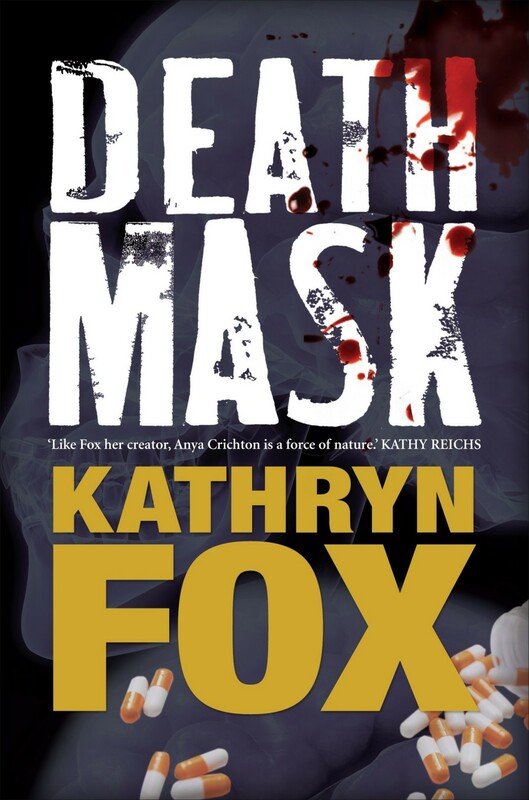 It is obvious to the reader that Kathryn Fox has a lot to say, lots of issues that she wants to make us aware of, and sometimes this novel takes on a bit of a didactic tone. But the plotting is so good, the tension so well built that by the end I could forgive her anything! Kathryn Fox is a medical practitioner with a special interest in forensic medicine. She has worked as a family physician, medical journalist and freelance writer. Her debut novel received international acclaim and won the 2005 Davitt award for best crime novel. This is her seventh novel following Malicious Intent, Without Consent, Skin and Bone, Blood Born, Death Mask and Cold Grave. An orchestral conductor has been found dead and Detective Inspector Jack Robinson needs the delightfully incisive and sophisticated Miss Fisher’s assistance to enter a world in which he is at sea. Hugh Tregennis, not much liked by anyone, has been murdered in a most flamboyant mode by a killer with a point to prove. But how many killers is Phryne really stalking? At the same time, the dark curls, disdainful air and the lavender eyes of mathematician and code-breaker Rupert Sheffield are taking Melbourne by storm. They’ve certainly taken the heart of Phryne’s old friend from the trenches of WW1, John Wilson. Phryne recognises Sheffield as a man who attracts danger and is determined to protect John from harm. Even with the faithful Dot, Mr and Mrs Butler, and all in her household ready to pull their weight, Phryne’s task is complex. While Mendelssohn’s Elijah, memories of the Great War, and the science of deduction ring in her head, Phryne’s past must also play its part as MI6 become involved in the tangled web of murders. Followers of my blog will realise that it has taken me a bit longer to read this novel than is usual for me. Part of the reason is that I spent the weekend at a crime fiction convention, but it is also true to say that I found MURDER & MENDELSSOHN a little more challenging to read. It was partly due to the setting that surrounds the murder of the orchestral conductor of the Harmony Choir. The author uses her own experiences of singing choral music to explore how the conductor and choristers feel about Mendelssohn, including some scripts in detail. There are many possible murderers when first one conductor, then another is murdered. Neither of the conductors has many friends in the choir or the orchestra but murder seems rather extreme. intelligence gathering, and particularly about her connections with MI6. Greenwood also uses the novel as an opportunity to explore homosexuality and this side plot takes up quite a bit of space, detracting a little from the main murder plot. Phryne herself also seems a little more promiscuous, while her lover Lin Chung is overseas. I did enjoy the glimpses of the splendour of Melbourne’s grand old dame, the Windsor Hotel, where some of the characters are staying, and where I have also stayed a couple of times. So this, the 20th in the Phryne Fisher series, didn’t delight me as much as #19 UNNATURAL HABITS. But I’ll be still lined up for #21. 1929: pretty little golden-haired girls are going missing in Melbourne. But they’re not just pretty. Three of them are pregnant, poor girls from the harsh confines of the Magdalen Laundry. People are getting nervous. Polly Kettle, a pushy, self-important Girl Reporter with ambition and no sense of self preservation, decides to investigate–and promptly goes missing herself. It’s time for Phryne and Dot to put a stop to this and find Polly Kettle before something quite irreparable happens to all of them. It’s a tale of convents and plots, piracy, murder and mystery . . . and Phryne finally finds out if it’s true that blondes have more fun. Nearly a quarter of a century on from the start of the series, Phryne Fisher is going as strong as ever. This remarkable, seemingly ageless, sleuth has gathered quite a household around her now, and also has the local police in her pocket. Most of Melbourne’s high society either count her as a friend, or they owe her something, and so she has passage into places that the police on their own could never penetrate, like the Blue Cat Club and the Abbotsford Convent and the Magdalen laundry. For me Kerry Greenwood seems to have captured well the essence of society’s attitude to unmarried mothers, as well the growing militant unionism of the late 1920s. A mark of her indefatigable research. 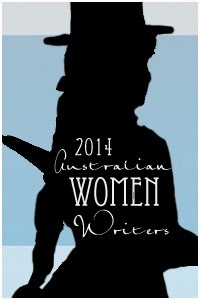 These novels carry the hallmarks of most cozies, with a tinge of Australian history and attitudes. There’s plenty of humour, and loads of well drawn characters. At the same time they are well plotted, and I think UNNATURAL HABITS is almost Greenwood at her best. Their growth in popularity, and that of the Miss Fisher television series, ensure they are also available overseas, at least in e-format, for a reasonable price. In 1948 a man was found dead on an Adelaide beach. Well-dressed and unmarked, he had a half-smoked cigarette by his side, but no identity documents. Six decades on we don’t know who he was, how he got there or how he died. Somerton Man remains one of Australia’s most mysterious cold cases. Yet it is the bizarre details of this case that make it the stuff of a spy novel. The missing labels from all his clothing. The tiny piece of paper with the words ‘Tamam Shud’ found sewn into the lining of the dead man’s coat. A mysterious code found etched inside the very book of Persian poetry from which this note was torn. Kerry Greenwood for almost her whole life. She goes on a journey into her own past to try to solve this crime, uncovering a new way of writing about true crime – and herself – as she goes. Let me point out first of all that there is only a tiny bit of crime fiction in this book – a short story in the last pages titled Tamam Shud: A Phryne Fisher Mystery in which Greenwood’s popular sleuth solves the Somerton Man mystery. The majority of the book covers the Somerton Man mystery and Greenwood uses it as a vehicle for paying tribute to her story telling wharfie father, a mountain of autobiographical detail, and telling us about Adelaide which seems to specialise in peculiar murders. The book was of particular interest to me on two counts: the first related to hearing Greenwood speak at Adelaide Writer’s Week yesterday, and the second because of the Adelaide setting, which is of course where I live. 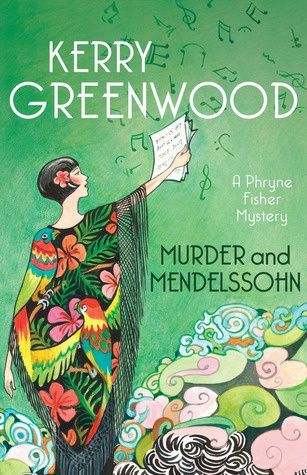 The book provides an opportunity for Greenwood to tell us a lot about her background, which we don’t get much of in either her Phryne Fisher or Corinna Chapman books. To me it feels a less disciplined book than either of those series, with Greenwood allowing herself to ramble tangentially from topic to topic, in fact over a diverse range of topics. There’s a glimpse of Adelaide just after the war, as well as in the 1970s. There are peeks into Greenwood’s family history as well as references to her childhood and adult life. There are references to the nature of poisons, the use of ear shapes for identification purposes, to events in world and Australian history, to the murders and disappearance of children in Adelaide, and then to some of the more popular explanations for the death of the Somerton Man. All that “true crime” detail is nicely complemented by the Phryne Fisher story at the end. When Corinna Chapman, talented baker and reluctant investigator, accepts an offer to do the baking for the film set of a new soap called ‘Kiss the Bride’, twists and turns ensue, with complications involving nursery rhymes and a tiger called Tabitha! multi-thousand dollar corporate theft). Jason, her baking offsider, has gone off to learn how to surf. And Kylie and Goss are fulfilling their lives’ ambition auditioning for a soapie. It should be a time of quiet reflection for Corinna but quiet reflection doesn’t seem to suit her – she’s bored. Scenting a whiff of danger, Corinna accepts an offer from a caterer friend to do the baking for the film set of a new soap called ‘Kiss the Bride’. The soapie in which Kylie and Goss have parts. Twists and turns and complications that could only happen to Corinna ensue involving, bizarrely, nursery rhymes and a tiger called Tabitha. While on the other side of town, a young woman is being unmercifully bullied by her corporate employers – employers who spend a lot of time cooking the books. Another enjoyable cozy in Greenwood’s Corinna Chapman series. 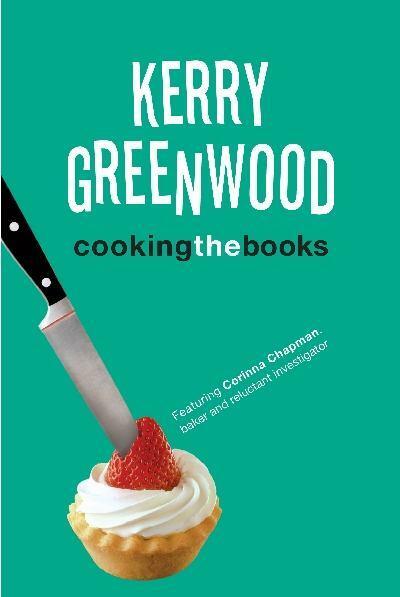 Corinna ventures into the world of the soapie tv programme, and Greenwood manages to make COOKING THE BOOKS feel a bit like a soapie too. Someone involved in the production of the pseudo reality tv series Kiss the Bride is trying to make life very uncomfortable for the main star. It hasn’t come to blows or murder yet, but it very well could. Corinna’s involvement in the food side of the tv production provides the main plot but there are several interesting side plots. In one of them, Corinna and Daniel are involved in a search for some missing bearer bonds. Their search becomes a treasure hunt following clues that look like old English nursery rhymes but actually contain obscure references to Melbourne landmarks. The technique reminded me of the cryptic clues Ian Rankin use in THE FALLS which I read recently. More than one of the treasure hunt clues solved by Corinna sent me Googling for pictures of the landmark in question. And speaking of Googling… Greenwood firmly places COOKING THE BOOKS in recent times as Corinna Googles for the stories behind the old nursery rhymes. A gentle read in many ways, one that furthers our knowledge of Corinna herself, that has several mysteries to be solved, that emphasises the multi-cultural nature and historical background of Melbourne (I think they should give Kerry Greenwood the keys to the city! ), and leaves the reader feeling replete and a little more knowledgeable. I got just a bit tired of chapter after chapter in that format, but I’m not sure what the alternative was. In preparation for the start of Miss Fisher’s Murder Mysteries, a new TV show which starts on Australian television this Friday (February 24), I thought it an opportune time to re-read the first book in the series on which the television show is based. In 2010 the 18th book in the Phryne Fisher series, DEAD MAN’S CHEST, was published but the series’ first book introduced the glamorous heroine 21 years earlier. It is the late 1920’s and when COCAINE BLUES opens the Honourable Phryne Fisher is attending a dinner party in England where she has lived since the age of 12. A guest’s valuable jewelled necklace disappears but almost before the distressed owner has finished screaming Phryne identifies the thief and arranges the discrete return of the item. This deductive prowess prompts a couple attending the party to ask Phryne to travel to her native Australia and investigate the case of their daughter who, they think. might be being poisoned by her husband. Phryne agrees, though on her own terms, and so heads to a country she last saw as a poverty-stricken child. In addition to investigating the issue that brought her home Phryne gets involved in the case of a backyard abortionist and sundry other activities. COCAINE BLUES is. primarily, a fun book to read. Phryne is an engaging mix of glamour, intelligence and sass. She jumps into life’s adventures with gusto, is kind to those who deserve it and cutting to those who don’t and takes people as she finds them rather than as society dictates particular ‘classes’ should be treated. It’s difficult not to like her. Here she meets some of the people who will become stalwarts of the series including Dorothy, or Dot, who becomes Phryne’s confidential maid (with other duties as directed) after Phryne prevents the young girl from carrying out her plan to murder her former employer with a kitchen knife. Dot is a bit wide-eyed at some of Phryne’s more outrageous behaviour but she is pragmatic about what she sees and is forceful enough to stand up for herself. There are some other good characters including two cab drivers who become involved in both of the main cases Phryne investigates and a female doctor who is appalled at the treatment of women at various levels of society. And there’s the hint hat COCAINE BLUES is not all about fun and frivolity as it does explore some deeper issues too. The female doctor has had to fight extraordinary prejudice just to become a doctor and now battles constantly to ensure women are treated properly by the medical profession in general. It never hurts us to remember how relatively recent it was that life was a grim prospect for many women and the way Greenwood incorporates this theme into the story here is interesting without once feeling like a lecture on the status of women. The mystery itself is a romp in the best sense of the word. There’s Russian royalty, a dodgy copper, an undercover outing and a near-death experience for Phryne and a ballet dancer before all is resolved satisfactorily. The series already has loads of fans but if you’ve not yet indulged you could do a lot worse than step back into 1920’s Australia with Phryne and her entourage. The first of 13 episodes of Miss Fisher’s Murder Mysteries airs on ABC1 at 8:30 on Friday 24 February. It stars Essie Davis as Phryne Fisher, Nathan Page as DI Jack Robinson (whose role will be larger in the TV series than the books I think) and Ashleigh Cummings as Dot. For international fans of Phryne I believe that rights have been sold into several markets so you should be seeing Phryne on screen soon. The first books in the series are being re-released this year with delicious new covers to tie-in with the TV series. People looking for crime fiction at the lighter end of the mood spectrum are not always well served. An increasing number of so-called cosy mysteries rely on ridiculously quirky gimmicks rather than actual plots and these same books seemed to be aimed at barely literate 11-year olds rather than adults seeking a bit of respite from grim environments and human anguish. Kerry Greenwood’s Corinna Chapman books are therefore a very welcome aberration in that they offer proper plots, intelligent writing and loads of humour alongside the dearth of bloody corpses. 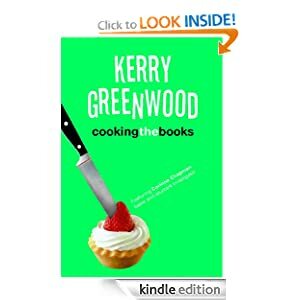 Cooking the Books is the sixth instalment of the series and sees Corinna struggling to grasp the concept of being ‘on holidays’ (I could teach the lady a thing or two here). She has closed her Melbourne bakery for a month and her apprentice has gone on a surfing holiday but when an old school mate asks for assistance with a catering job for a new TV production Corinna agrees willingly enough to bake bread and help out with other cooking duties. On the set of Kiss the Bride things are a bit fraught though as someone is playing a series of nasty practical jokes on the show’s star and tempers soon fray. Meanwhile, Corinna’s boyfriend Daniel, who is a private detective, is engaged to track down some missing bearer bonds which were left in a phone box by a harassed accounting firm intern and seem to have been spirited away by a homeless man called Pockets who has something of a literary bent. Having been raised in Israel Daniel doesn’t have the cultural references to the nursery rhymes being referenced in Pockets’ clues so relies on Corinna for some assistance with this case. I thought this book brought the series back to its best form, showing that you can have a thoughtful and engaging crime plot even when there are no dead bodies to be seen (well not until right near the end). The theme explored particularly well here is that of bullying and its various incarnations in our workplaces. You really do get a sense of the psychology at play when some people bully and others put up with being bullied. Happily for the victims in this instance help is at hand in the form of Daniel and Corinna who are, in my experience, of a lot more practical use than real-world bullying reporting mechanisms. Sometimes a situation calls for an articulate plus-size lady (and/or a bloke who might have been in Mossad) to lay down the law rather than the completion of a form in triplicate. Just sayin. Once again the story here involves Corinna and Daniel’s ‘family’, i.e. their neighbours in the inner-city Roman-inspired apartment building and the plethora of acquaintances they have made throughout the city. It is always nice to read a depiction of community and people helping each other out; a nice anecdote to the kind of book I read more regularly. The junk-food inhaling computer hackers, airhead actress wanabees, master salad dressing maker and white witch provide laughs, plot advancement and colour throughout the story. The arrival of an anchovy-obsessed tiger offered something new and different and I did find myself hankering for a big pussycat of my very own. Sure Cooking the Books is a light, quick read but it’s both fun and funny, has mouth-watering descriptions of wonderful food, shows Melbourne off very nicely and offers a decent plot and warm, engaging characters to boot. What more could you want? This post is published at http://fairdinkumcrime.com if you are seeing it at another site then it has been stolen and/or used entirely without permission.